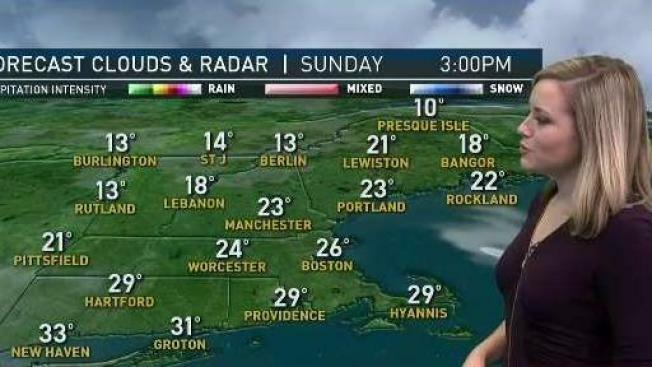 Sunday: Mostly sunny, cold. Highs around 30. Sunday Night: Increasing clouds. Lows in the teens and 20s. Monday: Mostly cloudy, few rain or snow showers. Highs in the 30s. After a downright frigid start to our Sunday morning with lows in the single digits south, and at or below zero north, it’s no wonder many are wondering when we’ll see a warm-up to at least seasonable norms. That answer is Tuesday when a warm front slides in and changes the direction of our winds to out of the southwest. However, before we get to that, we have to get through Sunday and Monday, which do include some interesting weather. Sunday will be sun-filled and quiet, with calmer winds, but still on the chilly side with highs struggling to make it out of the 20s. Sunday evening, clouds start to build in from the southwest, ahead of a frontal boundary that will bring us the warmth by Tuesday. Monday morning through midday, however, that frontal boundary will bring the potential for some snow showers that will change to a mix by midday, so be careful on your travels during the commute. It looks to be a dusting to an inch across most of northern New England with a light dusting along and north of the Mass Pike, but still enough to slick the roadways across New England. The wintry precipitation slides out by mid-afternoon. High temperatures Monday will range from mid to upper 30s south, and near 30 north. Tuesday brings high temperatures into the mid to upper 40s south and 30s north under a mix of sun and clouds. This is a brief warm-up, though, followed by a cold front that will bring colder and blustery conditions for both Wednesday and Thursday, along with a chance for another round of mountain snow showers with the passing of the front. Through Wednesday, it’s likely that along the Canadian border, between 3-6 inches of snowfall is expected including northern Maine, farther southward between 1-3 inches for southern Vermont, New Hampshire, and along the Massachusetts/New Hampshire border. Plus, after the front passes, Wednesday and Thursday, the wind shifts to out of the northwest, and the bank of cold Canadian air sinks southward into New England with temperatures slipping back into the 30s both days. Out of the two, Thursday will be the coldest with highs struggling to make it to the freezing mark. If you’re traveling during the upcoming holiday weekend, we’re looking at an active set-up with the possibility of a white Christmas. Another system will be on the horizon to our west for Friday, but at least temperatures moderate back to the 40s both Friday and Saturday, but there is a possibility for rain showers for Saturday, turning to snow showers north. It will be slightly cooler for Christmas Eve with highs in the upper 30s, with a slight chance for snow showers late and likely stretching into Christmas morning. We’re keeping an eye on the forecast and will give you the very latest details as we get closer to the holiday. In the extended forecast, temperatures take another frigid turn the day after Christmas. During the busy holiday season, be sure to download the NBC Boston / NECN app to get the latest weather alerts right to your phone when you’re on the go.